Placed in service on July 5, 1983 at a cost of $150.000. It had a 15,000 watt hydraulic generator, 15 ton hydraulic winch, A frame, 5 500 watt quartz flood lights. 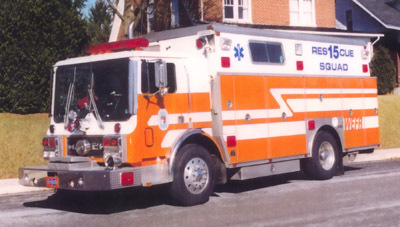 It was refurbished in 1994 by Interstate Truck Equipment, Hagerstown, MD. Items completed were: New emergency lighting, complete remodeling of interior compartment, new Budd wheels, new springs and shocks, engine and transmission serviced, and new paint and custom lettering and striping. 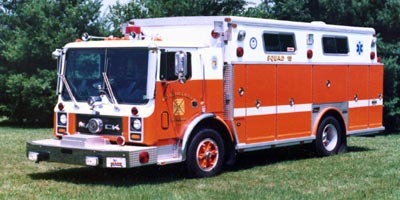 In 1999 it was placed out of service and sold to Sunbury Fire Department Sunbury,Pa. 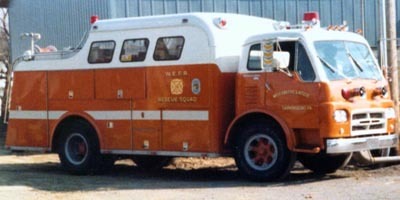 1961 International,Oxon Hill, Co 21, Prince George's County, MD. Purchased from the Oxon Hill Fire Department, Prince Georges County Maryland in May 1973 for $600. When purchased the squad was painted all red. In November 1973 the company authorized work to proceed on the unit. In January 1974 the squad was at Frey Motors getting a new transmission. 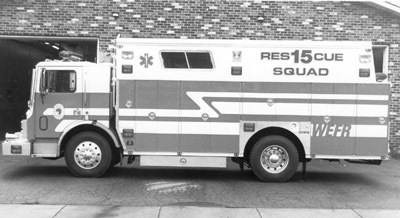 From there the truck was to go to Pierce Equipment Center to have the cab refurbished and then to Brumbaugh Body Company for final modifications. 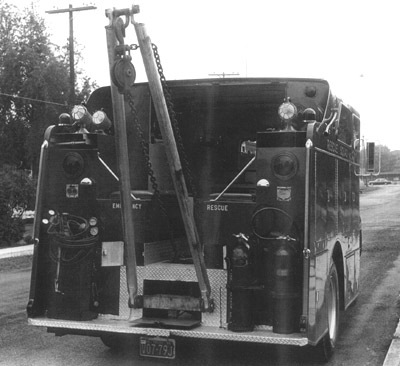 The unit was placed into service August 1974 at a cost of approximately $10,000. The unit was equipped with a 300 gpm pump, 400 gallons of water, a 549 cu. 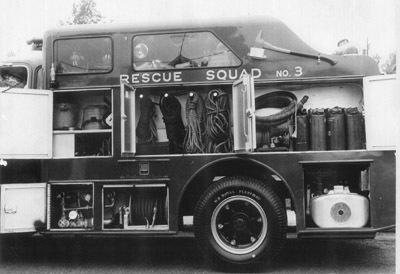 Inch gasoline engine, five speed manual transmission, 3500 watt onan generator with electric reel, a 40,000 pound rear winch with "A" frame, 10 compartments and two pre-connected lines. The unit was removed from service July 5, 1983 and offered for sale for $10,000. 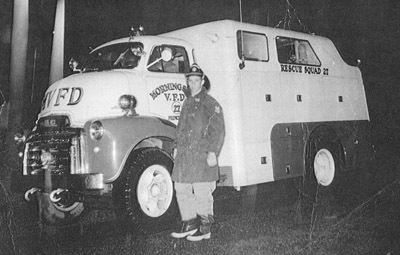 1954 GMC, Morningside Fire Department, Prince George's County, Squad 27. 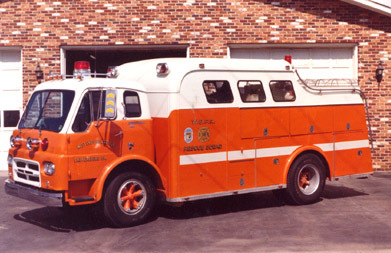 Purchased from Morningside Fire Department, Co. 27, Prince George's County, MD In Service 1963 to 1974 1954 GMC Rescue with Gichener Iron Works Body. 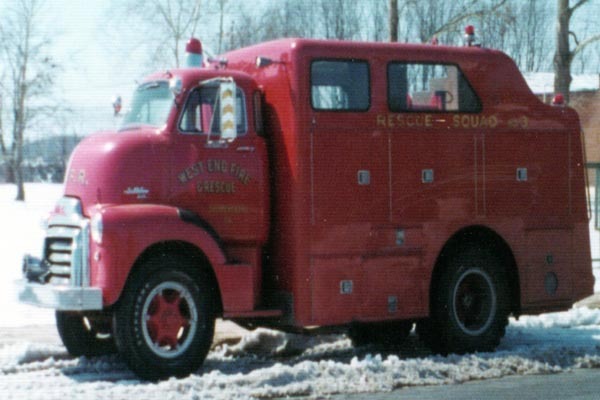 Sometime between March and May 1963 the company purchased the unit from the Morningside Fire Company, Prince Georges County, Maryland for an unknown amount of money. 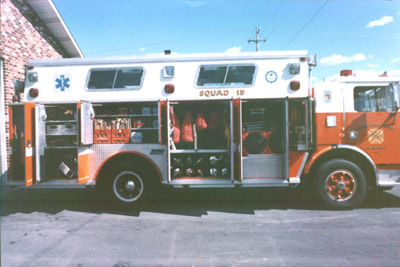 At the time the company purchased the rescue it was painted white with red fenders. 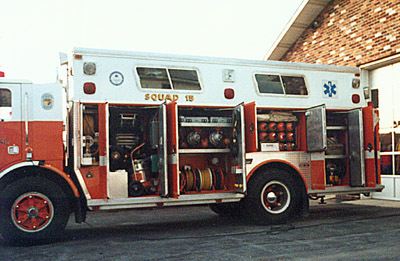 After purchasing the unit was sent to Brumbaugh Body Company to have modifications made and be painted all red. It was placed in service around August 1963. 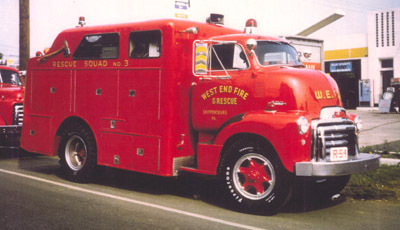 The unit replaced the 1947 Ford as the company's third rescue truck. 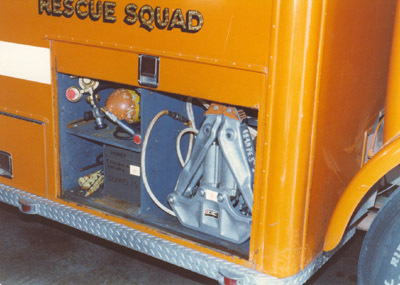 The rescue was equipped with a pump, generator, "A" frame and many tools. It was removed from service August 1974 after being replaced with a 1961 International Gertenslager. The unit was put up for sale, the company asking $5,000 to $6,500. 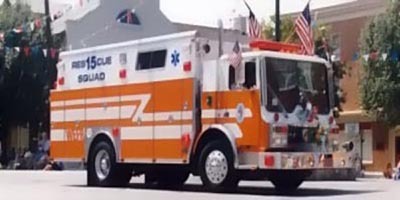 The company was unable to find a buyer for the rescue and at a company meeting March 2, 1976 they voted to sell the rig to a private group in Scotland, PA for $1,000. The group reportedly planned to use the truck for parts. Purchased from Barron Hill, PA sometime between 1959 and 1960 for an unknown amount of money. The company had the unit by June 1960 at the latest. The unit was painted red and only had minor changes made to the lettering. 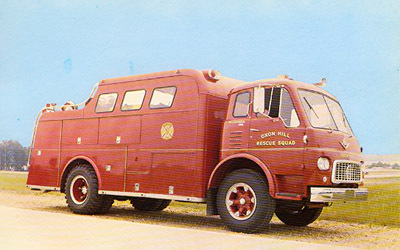 This was the company's second rescue truck and replaced the 1947 Dodge. 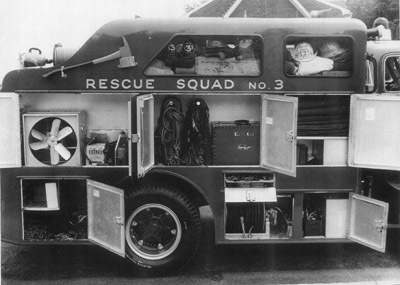 The rescue carried the unit designation C-109. 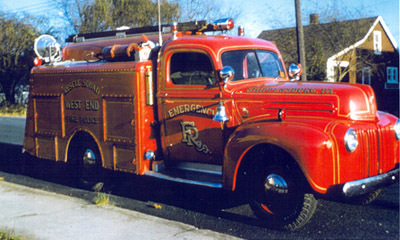 In August 1963 it was removed from service, replaced with a 1954 GMC. Not able to sell the unit it was taken to Naugle Motors in an attempt to sell it. It was still not sold in May 1965 and a minimum price of $300 was set. 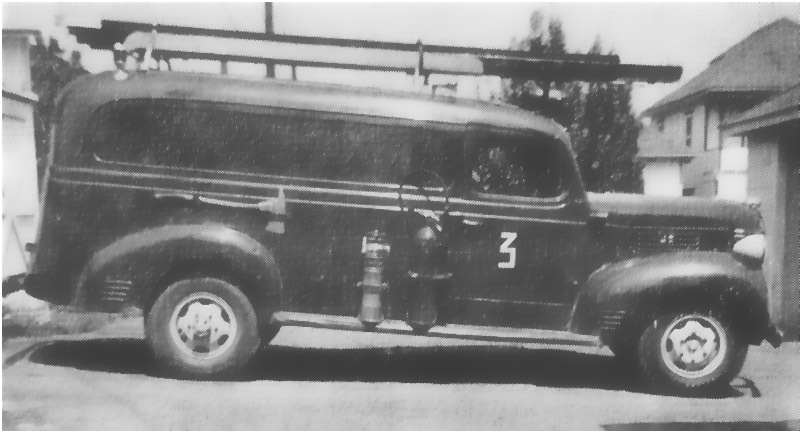 It is believed that later that month the company traded the rig to H & H Chevrolet for a pickup truck. 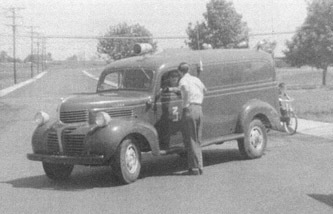 1947 Dodge Panel truck originally owned by Henry's Bakery, donated by Frank Hollar around April 1955 while the company was still in the planning stages as an annex to the Vigilant Hose Company. 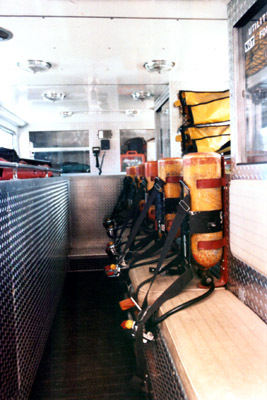 The unit was the company's first piece of equipment. 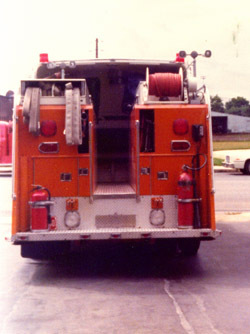 Merle Byers painted the unit red for the company. Company members mounted a ladder on the roof and lights and tools on the outside. 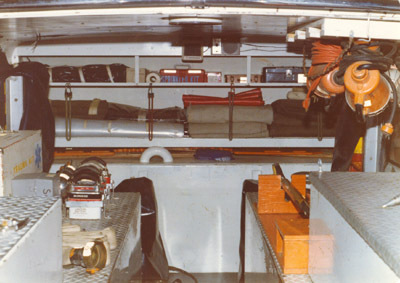 The inside carried a stretcher, chemox mask, fire extinguishers, salvage covers, protective clothing and rescue equipment. 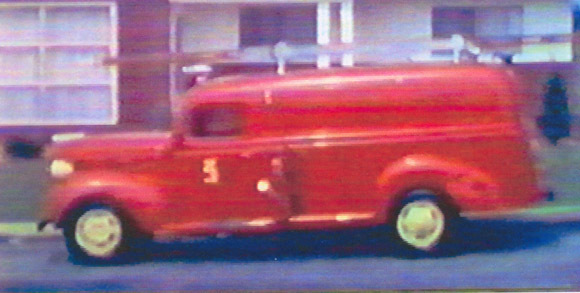 The truck was replaced with a 1947 Ford sometime between around 1960. It is not known what happened to the unit. 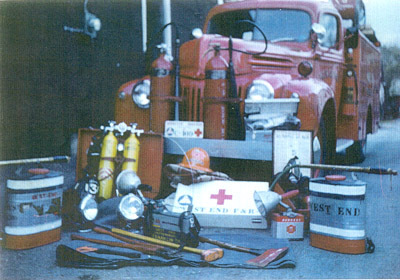 A very special thanks to Brad Myers, Tower 2, Harrisburg Bureau Of Fire and Historian, Shippensburg Fire Department for the histories of each apparatus and finding a lot of the old pictures.